Even with the popularity of smartphones, there may be adoption hurdles for location-based social networks. Facebook and Twitter may soon popularize the idea, however. (Mashable) -- For all their buzz and value, location-based social networks haven't really gone mainstream yet. Only 7 percent of Americans are aware of location-based social networks, according to data from Edison Research. Part of the explanation for this is that the majority of mobile users aren't using smartphones. And as a result, just 10 percent of those surveyed use mobile location services at least once a week, according to the Mobile Marketing Association's latest Mobile Consumer Briefing survey. For smartphone users, like those of the iPhone (a popular device among early adopters), that number jumps all the way up to 63 percent. Still, even with smartphones predicted to overtake feature phones sometime next year, there may still be adoption hurdles for location-based social networks. Here's a look at why location-based services haven't yet hit critical mass and what those platforms are doing about it. Kristine van Dillen, director of industry initiatives and partnerships at the Mobile Marketing Association, said location-based services aren't growing as quickly as they should be. One reason for the lag is concern over privacy and who has access to users' data. 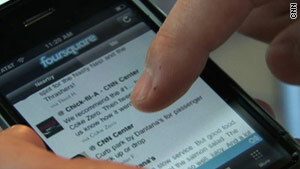 Concerns about loopholes in Foursquare that give others the ability to announce your check-inshave also been raised. "There's still a perceived risk in accessing location data," van Dillen said. One of the ultimate promises of location-based check-ins is more accurately targeted advertising. For some users, the privacy concerns of sharing their location might be trumped by the potential utility of receiving highly targeted advertising and promotions. Michael Boland, a senior analyst and program director at BIA/Kelsey said check-ins represent the makings of a business model, but they haven't reached their full potential value yet because there isn't a well-defined system to buy and sell advertising. "I think it does have a lot of staying power. We're only going to see it grow and evolve," he said. Twitter gives an example of one user tweeting about the weather in one location, while another user tweets about traveling to that very location. Unfortunately for Twitter, compared to sites like Foursquare and Gowalla which clearly indicate the value -- every check-in is part of a game, you can find your friends, get tacit recommendations for places to go, and maybe score a deal or two -- Twitter is only communicating what feels like a very niche and impractical value proposition. One thing Facebook does have in its favor is a great track record of getting people to eventually use new services en masse -- concerns or not. When Facebook launched its news feed feature in 2006 it faced a very vocal user backlash. A few months and a few tweaks later, the feature was widely used and has become an integral part of the service. The advantage for both Twitter and Facebook is that their users already have a built-in network of followers and friends, so they don't have to sign up for a new service and start adding people to it. The location feature is simply an add-on to their existing account. "Facebook could really be the looming giant that could wipe all [other location services] away," Boland said. "Facebook has proven to have so many users who are mobile. If they turn on that feature, it's the looming category killer."